In our high-tech society, science is always looking for ways to improve upon nature. When it comes to diet, science has repeatedly failed. Why? The human body is a highly complex organism that was designed to eat foods that occur in nature. Tampering with nature's delicate balance usually results in negative consequences. The more we refine our foods or encourage diets that do not have a balance of naturally occurring nutrients and fibres, the worse our health becomes as a society. Balance is a key to wellness and so we need a 'balanced' diet. Glycaemic-Indexing is a method of measuring how much a given food raises your blood sugar. The rate at which your blood sugar rises after eating is extremely important. Until recently, this rate has been an ignored factor in the total equation of weight management. When you consume a food with a high-glycaemic index, it causes your insulin to rise. This increase of blood sugar has many negative effects above the obvious, such as abnormally increasing your appetite. Sharp sugar spikes result in sharp sugar drops which cause you to crave high-glycaemic, fattening foods. Why not just count kilojoules? Although in a strict sense a kilojoule is a kilojoule, it must be understood that kilojoules do not reflect nutritional value, but rather energy. The nutritional value from 4000 kilojoules provided by vegetables and the nutritional value provided by 4000 kilojoules from confectionery are going to be vastly different. Just reducing kilojoules alone will not necessarily reduce your fat or contribute to a healthier body unless the kilojoules chosen are from the right foods. Sweets are high-glycaemic, and the stress on the body is obvious. Most vegetables are low-glycaemic, so they not only provide superior nutrition per kilojoule, but they also provide health-supporting fibre and do not contribute to blood-sugar imbalances and other detrimental effects. Low-glycaemic foods increase long-term stamina and help to reduce appetite. There have been patients who, on low-kilojoule diets, had little or no success in fat loss because they were not choosing the right kilojoules. Clearly, starvation will eventually reduce anyone’s weight, but the low-kilojoule intake is insufficient to supply you with adequate nutrition and fails to provide enough energy for you to carry out your daily activities and exercise effectively. Therefore, reducing kilojoules without considering the glycaemic index will cause the body to burn muscle as food before it burns fat as food. You need to be aware of your total kilojoule intake, but more importantly, aware of the quality of the nutritional value of the foods you eat. Eating low-glycaemic foods will help you do this. The best way to lose weight long-term is by taking in less energy (kilojoules) than required for your basal metabolism. Women typically require 8400 kilojoules daily, whereas men require 11,300. Eating low-kilojoule, high-quality food is essential. Why not just count fat grams? Some people have discounted fat grams completely in favour of various diet schemes, but doing so is a mistake. Fat grams do count (as do kilojoules), and no one should be loading saturated fat into their diets. Some fats are required for a healthy body, and some actually help convert stored fat into energy. Saturated fats do present a serious hazard to your health when consumed in high levels. There have been many who have failed on fat-gram diets because once again this is an imbalance and not the diet intended for the human body. Every person is genetically and biochemically unique. Therefore results and reactions vary. A common mistake is to look at isolated results that fit the theory of your choice and then declare that the method is absolutely correct. Low-fat diets do not work for all metabolic types, and in some cases they actually cause fat gain. How can this be? It is because low-fat diets often recommend foods that are high-glycaemic. Those foods raise blood sugar and can cause a rise in blood fats and stored fats in some metabolic types. The rise occurs because the liver will convert high-glycaemic carbohydrates into triglycerides, which in turn will be deposited in the arteries or on the body. The exception would be medium-chain triglycerides, which are absorbed differently and utilised as energy rather than converted to fat. Fat grams are included in a healthy diet (as are kilojoules), but differently than you may have seen them before. You need to be aware of your total saturated fat intake. Everyone needs fat in their diet, but excessive fat is not good. When selecting foods that have fat in them, select foods that contain essential fatty acids (EFAs). All fat-containing foods on a low-glycaemic diet fit inside this pattern. For example: if you eat just cake, you will get saturated fat but few if any EFAs, so the nutritive value of the cake is much less than the fish. Is low-glycaemic the same as low-carbohydrate? No, restricting absolute levels of carbohydrates is just as unhealthy as restricting absolute levels of kilojules, fat grams or protein. Carbohydrates are part of a healthy, balanced diet. All carbohydrates are not created equal. High-fibre green vegetables, such as broccoli, are low-glycaemic carbohydrates. Low-fibre white potatoes are high-glycaemic carbohydrates. The carbohydrates from each have a different effect on the blood sugar and insulin levels and a different effect on the deposition of body fat. When you start eating a balanced low-glycaemic diet, you need to listen to your body. If your body has been depending on a frequent high-glycaemic burst to get you through the day, you may feel an increased craving for high-glycaemic foods in the beginning. As long as you continue eating a balanced, low-glycaemic diet, these cravings will pass. This has happened for hundreds of people, and they have never gone back. The key is to understand what balanced and low-glycaemic mean! Did you still feel hungry, even after eating a meal? Did you feel fatigued, especially in the afternoon? Did you have difficulty concentrating? Did you have low-energy levels or low stamina (non-lasting energy)? Did you experience feelings of high and low blood-sugar levels? Did you experience poor sleep patterns? Difficulty getting to sleep or staying asleep? Did you feel sleepy after eating? How is the glycaemic index of a food measured? The glycemic index (GI) is a measure of the power of foods (or specifically the carbohydrate in a food) to raise blood sugar (glucose) levels after being eaten. The GI values of foods must be measured using valid scientific methods. It cannot be guessed by looking at the composition of the food. Currently, only a few nutrition research groups around the world provide a legitimate testing service. Professor Jennie Brand-Miller at the Human Nutrition Unit, Sydney University has been at the forefront of glycaemic index research for over a decade, and her research group has determined the GI values of more than 400 foods. Foods are generally categorised as being high-, moderate- or low- glycaemic. Now there is a certified mark to make healthy low GI shopping easier! 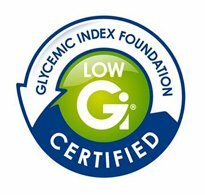 This Low GI Symbol indicates that the food has been assessed by the GI Foundation, a not-for-profit health promotion charity and it guarantees that the food is a healthy choice in its category, including been tested low GI. The food has been judged against a range of nutrient criteria, including its energy density, saturated fat content, sodium content and where relevant calcium and fibre content. Eat foods in their natural state whenever possible. Eat foods that are harder to digest. Don't mix diet fad principles. Make a commitment to yourself to be healthy. Here are some books, written by Dr Jennie Brand-Miller, which will put you on the right track with your choice of foods for a healthier slimmer you. And some Eating Tips to make things easier for you. Nuts and seeds are excellent low-glycaemic snacks and, in most cases, low-fat snacks as well. Almonds, cashews and peanuts are great examples of healthy snacks. Eating these nuts in their natural state or dry roasted can help balance your blood sugar, and they will taste great. Just as with other foods, moderation is the key. Snack servings should range from a half-dozen to a dozen between meals. Fibrous foods are also healthy snacks. Naturally occurring fibres from foods help you to maintain a clean and healthy colon, which is essential to your health. Various fibres also absorb fats. Highly fibrous foods such as celery do fit Rule No.3 (Eat foods high in fibre) but also fit Rule No.2 (Eat foods that are harder to digest). In fact, celery is actually impossible to digest – celery causes your body to work so hard in an attempt to digest it that it actually burns kilojoules when you eat it. Celery is an ideal vegetable to snack on. All green vegetables make a good snack and contain good, healthy carbohydrates. Fresh raw broccoli, as an example, make an excellent low-glycaemic snack. Carrots and cauliflower are also great snacks. All proteins are low-glycaemic. Some proteins, however, are high in fat. It's important to select proteins that are lean (if we're discussing meats) or proteins that are lower in fat, wherever possible. Proteins are extremely hard to digest. They convert very slowly to fuel inside your body. This very slow conversion process not only makes them low-glycaemic but also tends to help you maintain blood-sugar levels for longer periods of time. High-glycaemic foods are the main reason that most people are carrying excess body fat. The principal offenders are refined breads, sweets, sugar, white potatoes and fried foods. Bread: Eat whole-grain or other natural-state grains with seeds instead of white bread. Breads which are as close as possible to grain in its natural state (remember Rule No.1), breads that are very heavy, whole-grain with seeds – these breads are difficult to digest (Rule No.2). The are much higher in fibre (Rule No.3), and, in fact, breads of this type tend to be low-glycaemic. You can certainly consume them in moderation with each meal. Sweets: Sweets made of refined sugars and other refined materials are, simply, bad for your health. Understanding that fact, it can be useful to know that if you combine a low-glycaemic food, which is high in fibre or very difficult to digest, with a refined sweet, you can actually lower the total index by combining these two. Increasing water intake can help you with the reaction that sweets cause. Things that are naturally sweet like peaches and apples should satisfy your sweet tooth in most cases and give other benefits as well. Sugars that are refined are not in their natural state, they are not low-glycaemic, and they should be avoided. For a healthy energy boost, try adding a sachet of low calorie bHIP energy blend to your glass or bottle of water. Sugar Replacements, which are synthetics such as aspartame, should also be avoided. Currently there are several companies attempting to create new synthetics to replace aspartame. Agave syrup or agave nectar are extremely low-glycaemic and can also be used as a very safe and delicious natural sweetener. Fructose -fruit sugar from any source- has the same low-glycaemic index. Don't be fooled by marketing ploys that use the word "natural" or "organic". One common ploy is to take refined white sugar, mix it with high-glycaemic molasses to turn it brown, and then sell it as "natural brown sugar". That's actually higher glycaemic and more potentially harmful to you than white table sugar. Potatoes: Potatoes have many benefits in terms of vitamins, including vitamin C, potassium and, of course, rapid kilojoule energy. They are also very filling, but they are high-glycaemic. However, adding a naturally occurring fat such as butter to a white potato actually slightly lowers its glycaemic index. Do not be fooled, however: adding butter to a white potato cannot make a very high-glycaemic vegetable into a low-glycaemic vegetable. Better to avoid potatoes wherever possible. Fried Foods: The last and most important item on decreasing body fat. Fried foods are bad for you. Whenever possible, try cooking foods by methods other than frying. How much water should you drink each day? This will vary with each individual. The standard, well-known recommendation of eight 250ml glasses of water per day is typical for the average adult body. Individuals who have higher body fat process and use water less efficiently than individuals who have more lean body mass. Therefore, the fatter you are, the more water you need to drink to maintain the same level of health benefits. When you consume water, you should do so throughout the day. Sip water continually throughout the day as opposed to going several hours at a time before quickly drinking the liquid of your choice. Most of us consume very little pure water. Remember that soft drinks, coffee, tea, etc. are not a substitute for pure water. How do you know when you've had too much water? It is possible to drink too much water so if you get to the point when you feel like one more drop will make you sick, you've had enough. Most people, however, don't like water enough to drink that much. What kind of water is the right kind of water? Water needs to be filtered through a charcoal device at a minimum. Still mineral water or distilled water is recommended. You will find more about glycaemic indexing here.